Battles against ISIS can be won, but what about the war? Not a week goes by anymore without the world being affected by radical Islam. The latest victim of this barbaric, medieval ideology, was Berlin, Germany. In a scenario similar to the one that took place in Nice, France on July 14, 2016, a terrorist drove a truck through a crowded Christmas market, killing 12 and wounding 49. Anis Amri, the Tunisian immigrant who attacked the Christmas market was caught and shot as he was on the run in Italy. He had sought asylum in Germany a few years ago but was denied because of possible ties with radical Islam. Just days prior, Andrey Karlov, the Russian Ambassador in Turkey, was shot seven times in public in Ankara, while the Turkish shooter screamed Allahu Akbar (God is great) in Arabic, followed by “Do not forget Aleppo! Do not forget Syria! Do not forget Aleppo! Do not forget Syria!” The shooter was a Turkish police officer, casting a lot of doubt on how Turkey and many other countries vet their police, military and government workers. These two terrorist attacks took place within a week. Many more reports could be added to them as the world continues to be plagued by Islamic terror. The Islamic State seems to be the ideological thread between these violent murders across the planet. Their grip on Western civilization isn’t weakening, even if parts of the Middle East that they had taken are now taken back. The Middle East crisis with ISIS is just the tip of the iceberg. Sure they hate Israel and the Jews. They are indoctrinated at an early age to believe that Jews are “pigs and monkeys” deserving death. But their grip goes much deeper than boots on the ground in a couple of strategic places in the Middle East. Are we looking at a different kind of caliphate? Islamic State murders: By now, it is beyond obvious that the Islamic State will stop at nothing to further its apocalyptic agenda. It has been very violent and has graphically proven to the world that its murderous creativity is relentless. They will kill in many ways using men, women AND children to further their agenda of death. Suicide bombers are modern day kamikazes seeking Islamic bliss in paradise by killing more infidels. The culture of death that drives ISIS seems unstoppable against a world that values and respect life. Islamic State infiltrates: If–as everything seems to lead to– the Russian Ambassador shooter had a connection to ISIS, now we have an Islamist radical who infiltrated the Turkish police. ISIS’ most successful method of infiltration has been through the recent various waves of refugees especially in Europe. The November 2015 Bataclan massacre in Paris was facilitated by the migrant crisis ebb and flow throughout Europe. At least one of the protagonists came to Paris through that venue and they will continue to do so all over the world until better vetting systems are in place, using our political correctness to their lethal advantage. 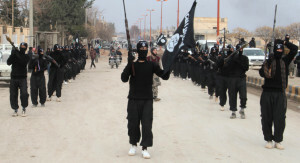 Islamic State recruits: They will actually pay people money to recruit for them. The shift in terrorism recruitment that started to take place with ISIS is the fact that the recruiters do not only target males. Females and children are now part of the ongoing Islamic State strategy for recruitment. For reasons that remain hard to figure out, they also have been rather successful at recruiting Westerners. This makes profiling much more complicated. Social media has also been a very fruitful platform for radical Islam recruiting. Twitter and Facebook still have a long way to go in helping with the eradication of Internet terrorism. We still see accounts being suspended for promoting “Islamophobia” and accounts remaining open that clearly promote antisemitism and killing of Jews amongst other things. Double standards seem at play on the social networks. Islamic State inspires: But the most dangerous aspect of the Islamic State is the fact that even outside of infiltrating or recruiting, they inspire! Their apocalyptic ideology of death is inspiring people to act on their behalf even without having been trained in Syria or elsewhere. Their magazines are polished and attractive. The attraction to ISIS is puzzling to most Westerners yet it is real. That is one of the major strength of the Islamic State, even though they will probably never establish any kind of global caliphate geographically speaking, they are establishing a virtual caliphate at a faster pace! This is what I believe will make the war against ISIS virtually impossible to win. but nobody can predict an attack like the killing of the French priest in Normandy. One of his killers had tried to enter Syria unsuccessfully and yet he bought into the ISIS ideology remotely…enough to murder an innocent old man who was not threat to Islam whatsoever. This is our challenge! I am afraid that the war against ISIS and any other sort of Islamic apocalyptic ideology like Al-Qaeda or Boko Haram will be a very long war for the West to fight. The old optimistic adage of “losing the battle but winning the war” has been reversed for our generation. I am convinced that we will successfully win many battles against Islamic terrorism but we might never win the war! While I was recently traveling throughout Israel, I drove about 600 miles. Looking at the landscape around me, I quickly realized that we were often driving nearby the Palestinian territories and at times even through some Arab neighborhoods. It was as if someone had ripped pages from the Bible and made street signs and town signs with them, pointing to The Galilee, the Dead Sea, the river Jordan, Ashdod, Jerusalem, Jericho, Ramallah, Gaza, Jaffa, Modi’in etc. I particularly fell in love with the Old City in Jerusalem. Its extensive color palette mixed with a myriad of scents was a perfect backdrop for Jews, Arabs and Christians to interact. We had dinner in an Armenian restaurant, a Jewish one AND an Arab one. If you asked me to tell you where the food tasted better, the answer would be…. YES! While the Middle East crisis is indeed a crisis and Israel is far from perfect, it is obvious that Jews, Arabs and Christians share their cultures, heritages and foods on a daily basis. The mix is simply overwhelming…in a good way, of course! Sadly, while I was in Israel I was also made aware of a video that was released to promote an upcoming conference in July 2015, by and for young adults. The conference promotional piece was advertised as coming from “Christ at the Checkpoint-Young Adults” or CaTC-YA. Yet, what it tries to do will turn your stomach upside-down. It sends the very clear message that Israel is equal to ISIS in violence and human rights violation. You see footage of ISIS thugs getting ready to decapitate rows of “infidels” dressed in the now world “infamous” orange overalls, juxtaposed with Israelis filtering Palestinians though checkpoints. Then, another frame shows the Islamic State brandishing their black flag followed by an Israeli tank brandishing a Jewish flag, making again a “not-so” subliminal connection. The attempt at drawing a parallel between ISIS and Israel shouldn’t be missed AND shouldn’t be dismissed either. It is a new low in Christian Palestinianism. To be sure, the parallel was already attempted by CaTC superstar Stephen Sizer, when he compared Israel to ISIS and even said that Christian Zionists were Christian Jihadists. Christ at the Checkpoint (CaTC) is a conference that started in 2010 and continues to take place every two years, sponsored by Bethlehem Bible College (BBC). The next official CaTC conference should take place in March 0f 2016 with the theme: “The Gospel in the face of religious extremism.” In the meantime, a group of young adults proponents of the same agenda, is promoting a 2015 date. Their video is posted on their Facebook page and on the CaTC YouTube channel. This raises some serious concerns about the biblical integrity of Bethlehem Bible College. How could they possibly claim to be Christians and promote such virulent demonization of the Jewish people and Israel. There is always the possibility that the video in question was produced by a group of supporters not necessarily officially affiliated with either CaTC or BBC (although currently posted on the CaTC YouTube channel). Even if it is the case, we need to hear from either or both very soon. I fear a silence that will of course speak tons about their position. I cannot help but ask CaTC and BBC which “Christ” do they mean in “Christ at the Checkpoint” and which “Bible” do they use to validate him? If CaTC and BBC do not distance themselves from such unbiblical libelous attacks, they will further validate their anti-Semitic stance. This will leave a vast number of uneducated and/or gullible Evangelicals with a choice to make as well. Each choice we make leads to consequences. Would they continue to support and attend such a conference as it compares Israel to ISIS? I certainly hope not! You can only claim ignorance for so long before you loose your credibility and ruin your reputation, but then again in a world were tolerance and political correctness are measured by one’s level of hatred for Israel and the Jews, I might be asking for the impossible. In the meantime, if you want to know what’s going on in Israel, start by reading your bible and then consider making a trip yourself and experiencing some of what I just experienced for a few days. Incidentally, I drove by the Israeli towns of Ramallah and Jericho (under Palestinian authority) where Jews ARE NOT WELCOME EVER, and I drove by plenty of Israeli areas where Arabs AND Jews live in relative peace. But of course that is a topic that will never be covered at such conferences! The theme of next year’s Christ at the Checkpoint 4 is “The Gospel in the face of religious extremism.” As of right now, I doubt that what is meant by religious extremism pertains to Islamism and/or the Islamic State. Based on the current trend and this new video, Zionism and Israel are in the crosshairs. It doesn’t matter if you follow Yeshua (Jesus) or not, the fact is that He was born a Jew not a Palestinian. He was born in Eretz Yisrael not the Palestinian territories and taught His followers to love their enemies and pray for those who persecute them (Matthew 5:44)– something that isn’t a characteristic of CatC proponents. So really, which Christ is at their checkpoint?